A highly decorative early 20th century two drawer French writing table, veneered in Kingwood with floral marquetry. 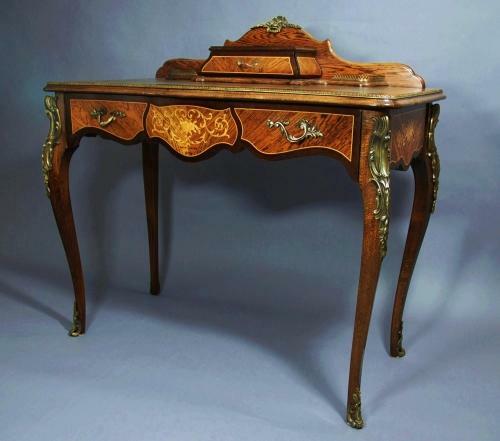 The table consists of a shaped and tooled green leather top surrounded by a Kingwood and ormolu banding with a small drawer to the back of the table top with a brass gallery. This leads down to a long drawer consisting of veneered floral marquetry decoration, the side panels also having floral marquetry decoration leading down to cabriole legs with ormolu mounts. This table is in very good condition, is of stable construction and can go straight into a home or office.